To sync with an Android or Google Calendar device, tap the gear icon on your Calendar tab to reach the Calendar Options screen. 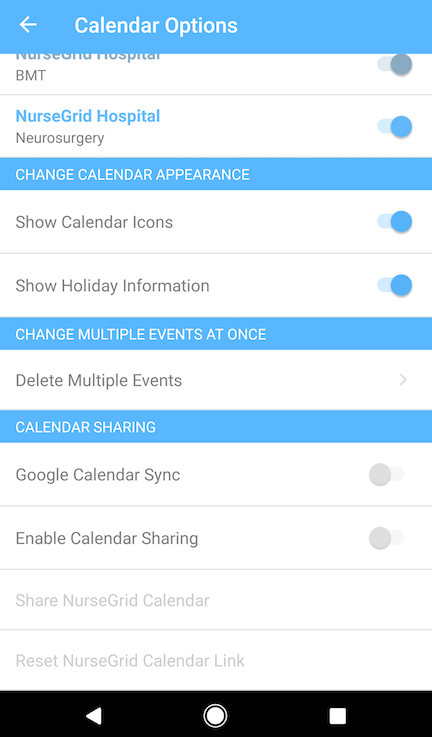 Underneath the "Calendar Sharing" heading, find Google Calendar Sync and tap the toggle to the right. 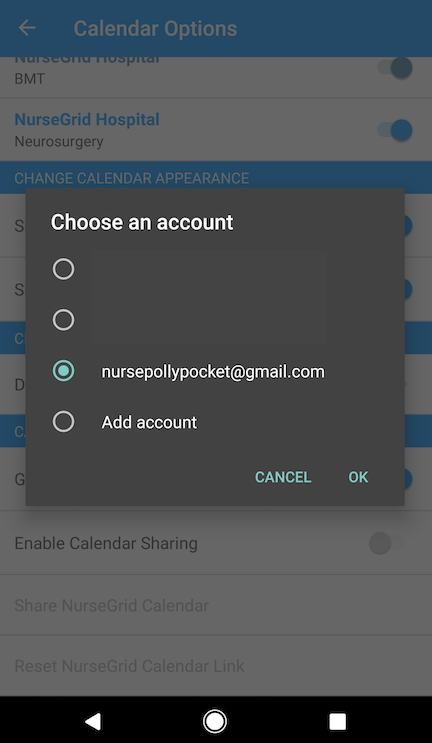 Then, when the gray popup shows, select which Google calendar you want to sync and tap "OK."
If you're unable to sync your calendar through this mechanism, toggle on Enable Calendar Sharing, then tap "Share NurseGrid Calendar." Select a message or email, or "Copy to Clipboard" from your device's options. If you sent the link to yourself, open the message in your messaging or email app and copy the URL provided. Navigate to https://www.google.com/calendar on your desktop computer and log into the Google account your Android device is connected to. On the left-side menu, find "Other Calendars," then click the drop-down arrow on the right. Select "Add by URL" from the drop-down menu and paste the calendar URL you copied earlier. Finally, click "Add Calendar." The calendar will now appear on the left side of your screen under "Other Calendars." Please note that it might take up to 12 hours for your NurseGrid shifts to show up in your Google Calendar. 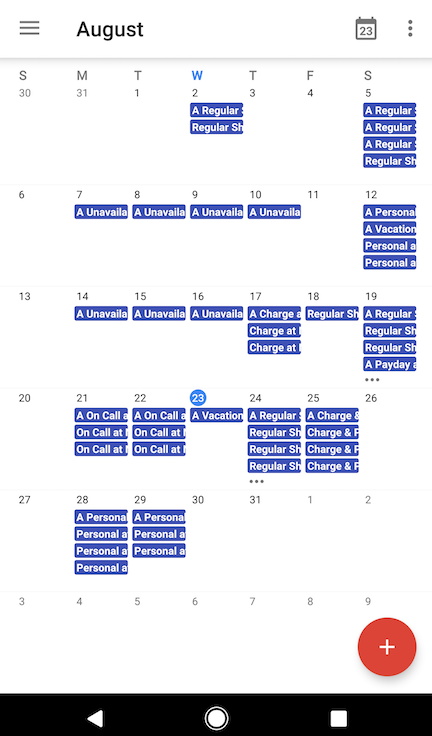 To see your shifts show up on your Google calendar through your Android device, open the Google Calendar app. Open the Calendar menu and tap "Calendars to display." Then tap "Calendars to sync," select your "NurseGrid Shifts" calendar, and hit OK. If you have Android 5.0 or higher, please follow these additional steps to ensure your calendar syncs correctly: refresh your calendar by tapping the ... icon in the top-right, then tap "Refresh." Tap the three-line icon in the top-left and select "Settings." Then, tap "Show More" and tap the "NurseGrid Shifts for (YOUR NAME)" option. Switch the Sync toggle to on, then return to the calendar view by tapping the back arrow. Your shifts should now show up on your Android device! If these steps do not enable your shifts to sync correctly after 12 hours, please turn off your calendar sharing, refresh the app or web page, then turn the calendar sharing back on to refresh the calendar link and try the steps above again. Need to revoke someone's access to your shared calendar? Tap "Reset NurseGrid Calendar Link" at the bottom of the Calendar Options screen.